We love all our patients, but many of them don’t return the feeling (we don’t take it personally). Visiting the dentist is not a pleasant experience for millions of people, and it explains why so many, even those who have dental insurance, avoid our office at all costs. Having good oral health habits at home, like brushing your teeth twice a day and flossing is an excellent way of taking care of your teeth and mouth, but it’s not enough. You need to visit us every six months for optimal oral health. Why Visit the Dentist Twice a Year? One of the most important reasons to visit us twice a year is so we can keep a close eye on your oral health. Regular cleanings and X-rays when needed, allow our dentists to stay on top of any potential problems and we can spot some issues that may arise in the future, especially in younger patients. Preventing plaque with professional cleanings by our friendly hygienists is a top priority in our office. Plaque is that sticky residue that is hard to remove even if you use the most sophisticated electric brush. Only we can remove plaque with our dental tools. The more plaque you have in your mouth, the higher your risk of developing cavities or gum disease. A primary consideration, especially when you don’t have insurance is cost. If you visit us regularly, your teeth will be as healthy as they can be. This also allows us to catch major problems in the early stages. 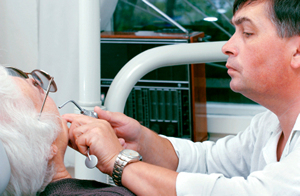 Ignoring dental problems will only make matters worse and cost you more money in the end. If you have any questions about why you need to visit us every six months for optimal oral health, please let us know.